As a reporter for the ABC’s science program Catalyst, Maryanne Demasi became a target of the breakfast cereal industry for “active defence” for documentaries she produced which challenged orthodox views about sugar, fats and gluten. 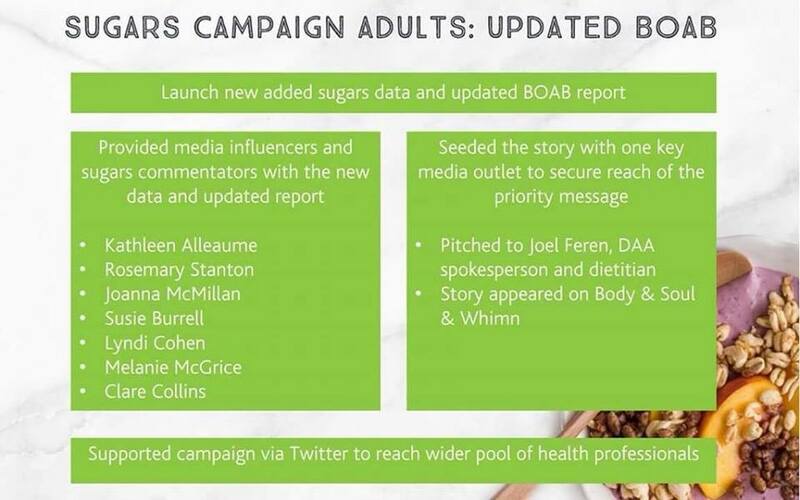 She reports on the sugar lobby’s latest tactics to co-op “key media influencers” to echo the mantra that breakfast cereals are good for you. Leaked documents have revealed the secret tactics used by a food industry front group to sanitise negative messages about breakfast cereals. 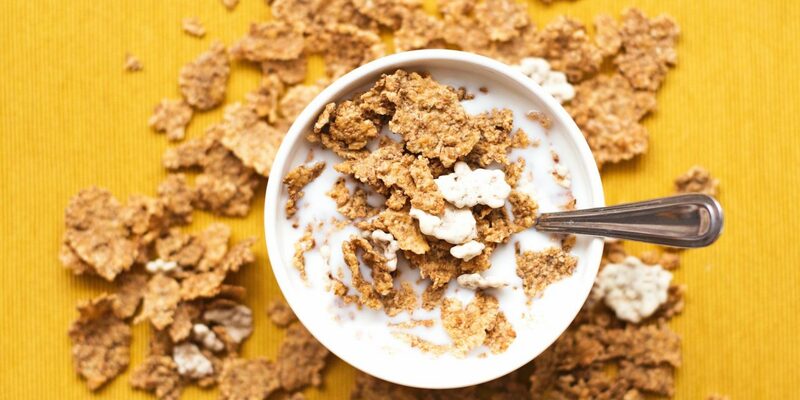 The private documents are from the Australian Breakfast Cereal Manufacturers Forum (ABCMF) of the Australian Food and Grocery Council, the industry association which represents cereal companies like Sanitarium, Kellogg’s and Nestlé to name a few. In what appears to be an embarrassing mishap, the confidential documents reveal the organisation’s strategy for influencing public opinion about the benefits of cereal and cereal products by co-opting influential health professionals to peddle its own industry-funded science. The documents detail action plans to target “key media influencers” who might be agreeable to “neutralising negative coverage on breakfast cereals by actively engaging with the media”. Among the desired names are high profile nutritionists like Rosemary Stanton, Catherine Saxelby, Susie Burrell, Melanie McGrice and Joanna McMillan. The recorded minutes from meetings describe ways in which the organisation orchestrates campaigns to generate “paid influencer posts” to achieve positive social media activity. When asked, the ABCMF confirmed, “a few [influencers] were paid for their posts” but it did not confirm whether they included nutritionists. On social media however, nutritionists and accredited practising dietitans are seen promoting the ABCMF’s cereal campaign. This has stoked the ire of some dietitians within the profession. “What we see in these documents is how our ‘experts’ are procured and fed an industry agenda under the guise of “research” and “challenging misinformation”, says Melanie Voevodin, Dietitian and Health economist. 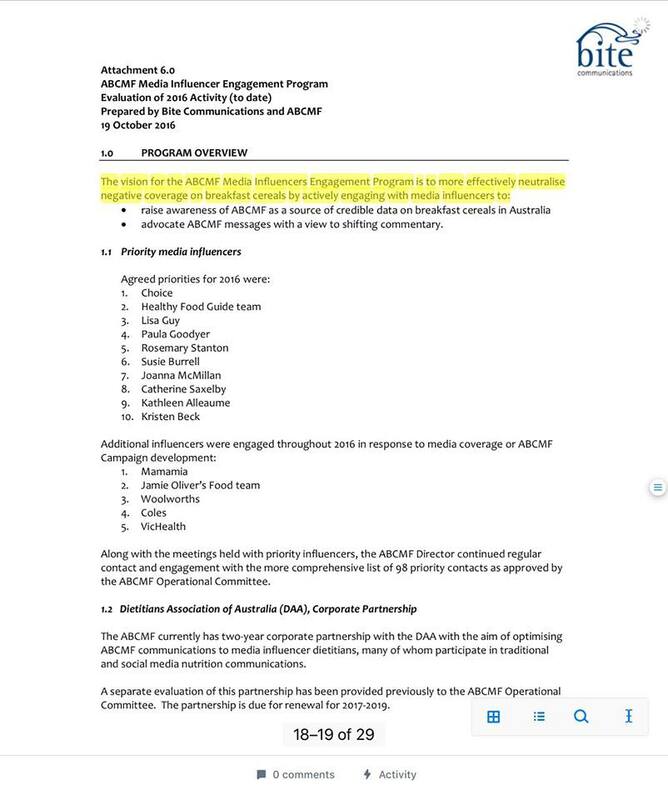 The ABCMF rejects any criticism about its alignment with ‘media influencers’. “It’s completely appropriate for ABCMF to communicate with nutrition professionals and journalists about nutrition and breakfast cereals. We share category data, peer-reviewed research and articles that professionals may find of value”, says the ABCMF in a statement. However, it becomes apparent from the documents which the ABCMF commissions, its studies are carried out by ‘industry friendly’ scientists and then the findings are selectively reported. One report boasts that breakfast cereals are a rich source of fibre, vitamins and minerals, but then excludes the part of the study which showed that consuming sugary breakfast cereals(>30g/100gm) can account for more than 20 per cent of the total sugars in adults’ and kids’ diets. This would put sugar from these breakfast cereals in the crosshairs along with sugar-sweetened beverages. In fact, recorded minutes from a meeting in 2017 reveals that the ABCMF should “recognise risks around communicating [the] data and avoid driving conversation/coverage related to this”. Put simply, they hope to bury the information. “When a food-manufacturing sector is providing science and healthy eating advice, it seems reasonable to assume that it would present that sector in a favourable light”, says Adele Hite, US-based dietitian. The documents also divulge how the ABCMF has scrupulously aligned itself with public health authorities like the Dietitian’s Association of Australia (DAA), the peak body representing dieticians. The ABCMF funnels money ($23,000 pa) into the DAA which in turn, uses its own dieticians to promote industry-sponsored propaganda, disguised as ‘science’ and ‘evidence-based dietary advice’. In a cringe-worthy read, the organisation describes how it supplies the DAA with “images to support ABCMF recipes on the DAA website” and a “#mybrekkiebowl cookbook” to be managed by the DAA. It says its aim is to inspire the consumption of cereals by providing the DAA with “more inspirational breakfast cereal imagery”, ostensibly to capitalise on the imprimatur of the DAA. The ABCMF confirmed its relationship with the DAA but said it was not responsible for the information disseminated by the DAA. “We provide the DAA with data and reports, and DAA decides if they are appropriate to share with its members. The members then make their own assessment of its value. Any DAA comments on ABCMF information are entirely up to DAA”, stated the ABCMF. This is unacceptable to others, who say trusted health professionals should not be obtaining their dietary facts from industry. Clinical nutritionist and researcher, Elizabeth Mountford says, “My concern with any sort of commercial arrangement between ‘for profit’ entities and a public health body such as the DAA is that it compromises its ability to remain impartial”. “If the DAA is provided with information and evaluations of science by industry sectors, there is no clear separation between those interests and the interest of accrediting dietitians, which in turn affects how patients/clients are advised regarding dietary health”, says Hite, a vocal critic of the DAA’s association with industry. The DAA has strongly rejected claims its relationship with industry has any influence over its dietary advice. It states, “DAA values its independence and will not be influenced in any statements, positions or opinions by its commercial agreements”. However, the evidence in these leaked documents only serves to strengthen the scepticism of its critics. The organisation even proposes “active defence” against those who pose a threat to their messaging and branding. Presumably, its purpose is to undermine anyone else’s interpretation of scientific evidence that might dissuade individuals from eating breakfast cereals. Among those who featured prominently was TV chef, Pete Evans, who advocates the paleo diet, which excludes grains and cereals. But ‘active defence’ was not limited to TV celebrities. They single out Dr Kieron Rooney, exercise and obesity researcher from the University of Sydney and Dr Gary Fettke, orthopaedic surgeon who rose to prominence when he was sanctioned by the Medical Board for prescribing low-sugar diets to patients with type-2 diabetes. “On the one hand, you feel empowered that they are that concerned about what you say and on the other hand you feel quite fragile that you’ve got multi-billion dollar, multi-nationals that have targeted you”, says Dr Gary Fettke “We’re like mosquitoes in the room, we’re a nuisance to them”. As a former reporter for ABC’s science program Catalyst, I was also listed as a target for ‘active defence’ for documentaries I produced which challenged orthodox views on sugar, fats and gluten. Of concern, one of the documents highlights that dietitians who are supportive of Low Carb and Paleo diets are at risk of “formal complaints and penalties”. This is rumoured to be the motivation behind the expulsion of dietitian, Jennifer Elliot, from the DAA in 2015 for prescribing a low carbohydrate diet to a patient with type-2 diabetes. The audacious nature in which the organisation targets its perceived enemies is probably not entirely surprising. Many might even have expected that industry would protect its turf and its profit margins. After all, there have been recent reports that cereal sales have slumped amid changing diets. And a study just released, revealed four out of five ‘healthy’ people showed a surge in blood sugar levels “sometimes at the same severity of people with diabetes”, after eating a bowl of cornflakes with milk. The lead author of the study recommended people steer clear of eating cornflakes. So does the disinformation from the cereal industry pose a danger to the public? “This is where I think this campaign crosses the line from ‘industry protecting its turf’ to a dangerous insertion of industry into clinical care”, says Hite. “Industry has the absolute right, and legal duty to its shareholders, to maximise its profits”, says Mountford. “[Unfortunately] it will always take precedence over what is in the interest of public health. 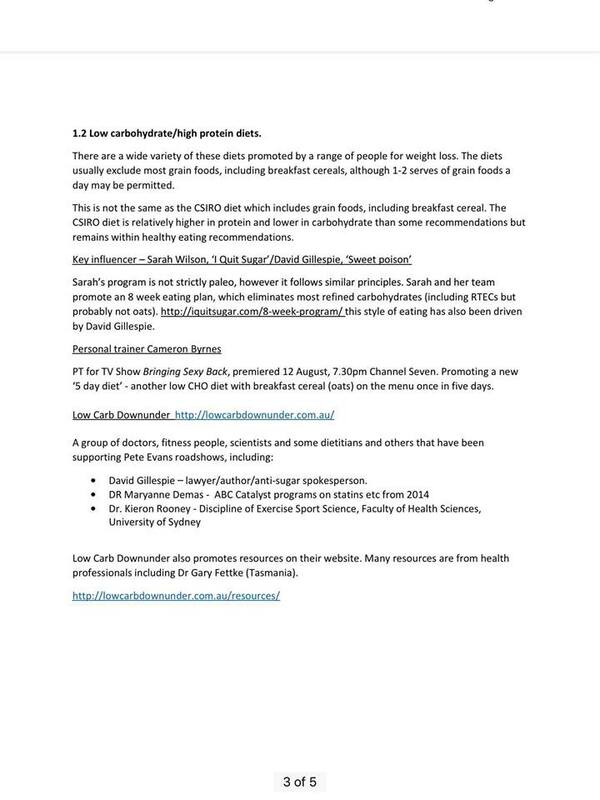 It is clear having looked through the ABCMF documents that Australian diet and nutrition messages are fraught with prejudice and conflicts of interest”. The prevailing view now, is that it is no longer possible to rely on the dietary advice being disseminated by health professionals and trusted health authorities with direct financial ties to the food industry. “It simply encourages the public to not trust information that comes from dietitians, a process that is already taking place, which is why the ‘active defence’ is needed”, says Hite. Dr Maryanne Demasi is an investigative medical reporter with a PhD in Rheumatology. Follow her on Twitter @Maryanne Demasi. Demasi has also written a series of investigations into statins, one of the world’s most lucrative drugs, for michaelwest.com.au. ABCMF is committed to providing up-to-date information on the Australian breakfast cereal category as fully disclosed on our website. It’s completely appropriate for ABCMF to communicate with nutrition professionals and journalists about nutrition and breakfast cereals. We share category data, peer-reviewed research and articles that professionals may find of value. This information is also publicly available on our website. What professionals do with the information is completely up to them. We also monitor commentary and correct misinformation where appropriate. To interpret a contact list as a list of paid influencers is completely wrong. These people are not paid influencers. They are simply nutrition professionals and journalists we routinely talk to in the course of our work. ABCMF has been a corporate partner of DAA since 2015, which is fully disclosed on the DAA website. We provide the DAA with data and reports, and DAA decides if they are appropriate to share with its members. The members then make their own assessment of its value. Any DAA comments on ABCMF information are entirely up to DAA. The documents shared on social media are documents typically used in the day to day operations of an organisation. It is common practice for government, NGOs and private sector organisations to maintain contact lists of stakeholders and journalists.